100 Year Anniversary of Mustang Creek Golf Course! Join our Facebook page and receive LIVE updates for Specials, Product Sales and "Competition!" Need a Google map to Mustang Creek? 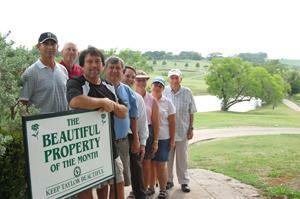 Keep Taylor Beautiful awarded the Beautiful Property of the Month award to the Mustang Creek Golf Course. Pictured, from left to right, are Rogelio Denova, Tim Mikeska, Jim Campbell, Willie Gore, Jonathan Kamenicky, Gayle Daniell, Norma Shorts and John Wehby. 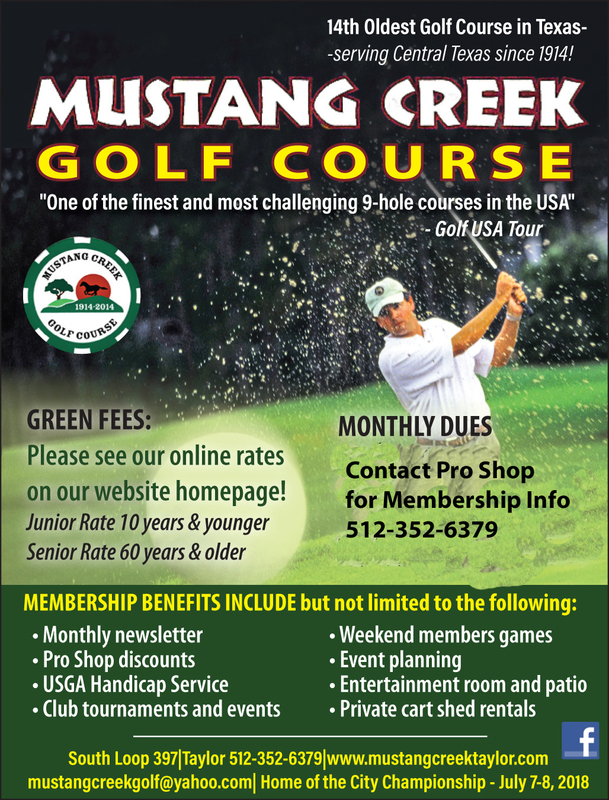 "One of the finest and most challenging 9 hole courses in the USA" Golf USA Tour"
The History of Mustang Creek Golf Course is very unique. In 1915, a group of local bankers purchased 60 acres on Washington Heights overlooking Taylor Texas . They noticed the open plains and gently rolling hills looked similar to the historic courses in Scotland. A few years later the Taylor Country Club was built on the same property. 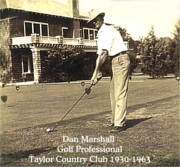 For 64 years the course was a semi private club with emphasis on the beautiful Clubhouse, Pool and Famous Food. 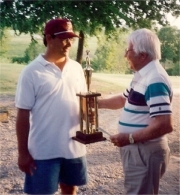 In the mid 1980's a group of local businessman purchased the golf course from the Taylor Country Club. Since then, the Board of Directors, Stockholders, Superintendents, and Staff of Mustang Creek have continued to invest and improve their course. Today Mustang Creek is a challenging course with lush tee boxes, fairways and greens. Our friendly staff in the pro shop is ready to assist you with family memberships, green fees, cart rentals, food, beverages, lessons, and tour quality golf equipment. On behalf of our family at Mustang Creek Golf Course, I invite you to enjoy our course and to please e-mail me with your opinions. President, Taylor Golf Course Inc. 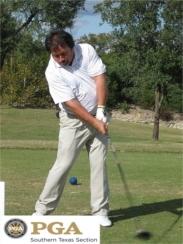 Copyright © Mustang Creek Golf Course Inc. All rights reserved.